Movement was the theme for yesterday . . . I woke up and the sun was out. 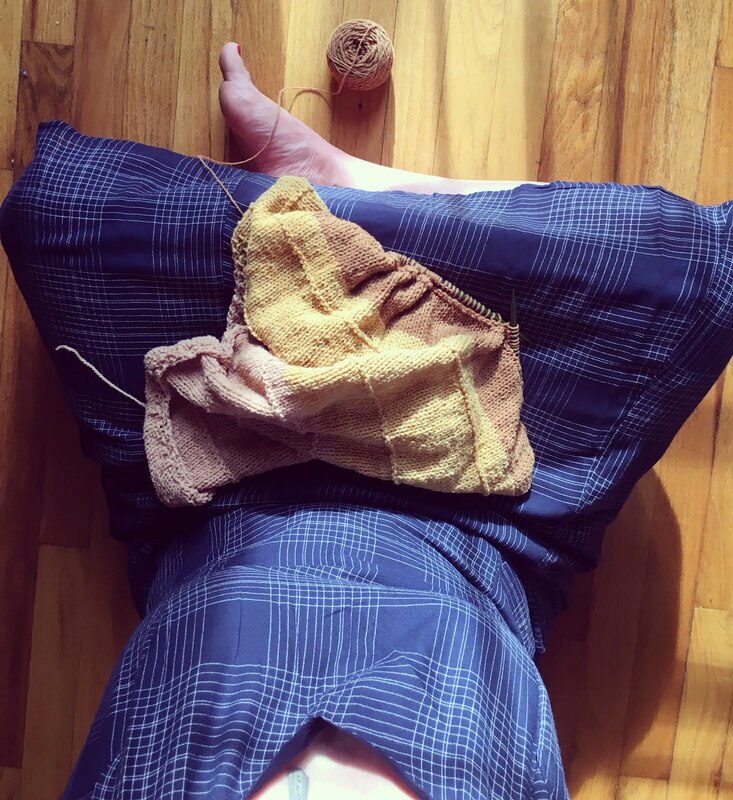 It was a breath of fresh air and vitamin D. I walked a few blocks to an estate sale I had heard about that mentioned the promise of yarn. Estate sales are often a little odd and bittersweet, rubbing elbows going through someone's home sifting through their possessions. In this case I learned from another neighbor the lady had passed after a long battle with cancer. With respect I found my way up to her crafting rooms. I was immediately struck that she had great taste in yarn. 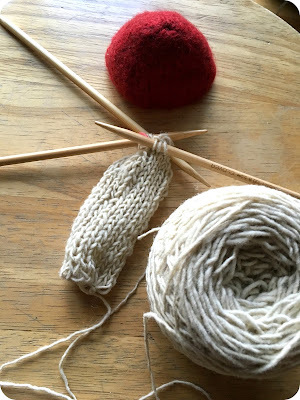 I tried to control myself and decided to pick one grouping of a UFO (Un-finished Object) that came with about 10 skeins of alpaca. I also picked up her copy of Joy of Knitting and a beautiful bag. I am excited about the opportunity to carry on some knitting that was started by this woman in my community that seemed to have such joy in a shared love of hand making. 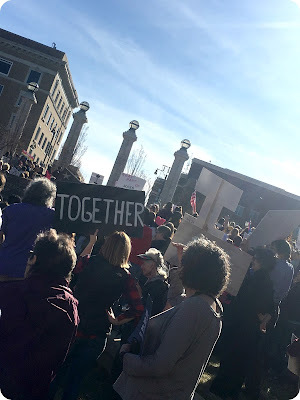 I grabbed a quick snack at home and then my husband and I biked down to our local community sister solidarity march for Women's March movement yesterday. By far this is one of the largest gatherings I have seen in my community since Obama visited our town during his first campaign run. It was empowering, it was angry, it was peaceful, it was a warm up and a steady stream of movement in our downtown. It was amazing to see the world wide response yesterday but I also know that there is still so much to do. I was excited to see a very organized next campaign called 10 Actions 100 Days. The first action is postcard writing to senators. Will you join? It started to come together for me why the Pussyhat Project had such a big appeal to me (besides the knitting element) it was that it was a handmade element. 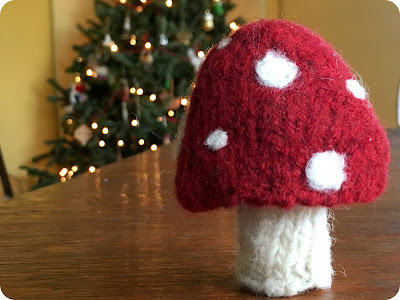 Maybe you made your own hat, or maybe you connected to a hand maker through the project or it was an aunt or a friend of a co-worker. However it happened you connect with something handmade not bought in the department store. It stood as a symbol of the movement. 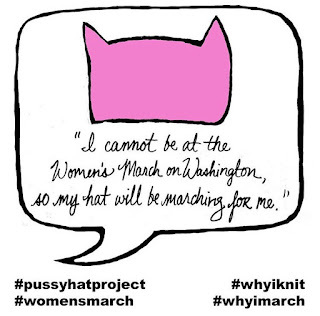 So though I thought my pink pussyhat knitting was done, I am formulating a plan to continue to knit hat for those who would like to donate to causes that support this movement. I will be developing this more in the coming weeks stay tuned and let's keep the movement going together. needing some pink during these grey days . . . I have been dreading today since November. It is of no surprise that the weather seems to be mirroring my mood today. So I am finishing up the last of a project that I have been working on for a month in preparation. Normally I am not much of a pink fan but for the past month I have been knitting hats for the upcoming Women's March on Washington. 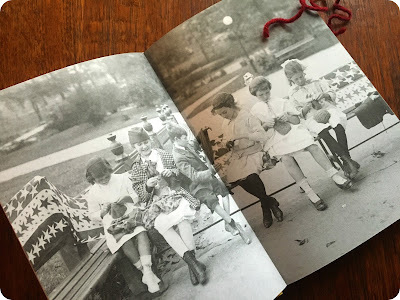 Stitching together these hats that women would carry with them to march in solidarity has been a bright spot in my own mental preparation of saying goodbye to an incredibly impactful president and stepping into a 4 year run of The Twilight Zone. 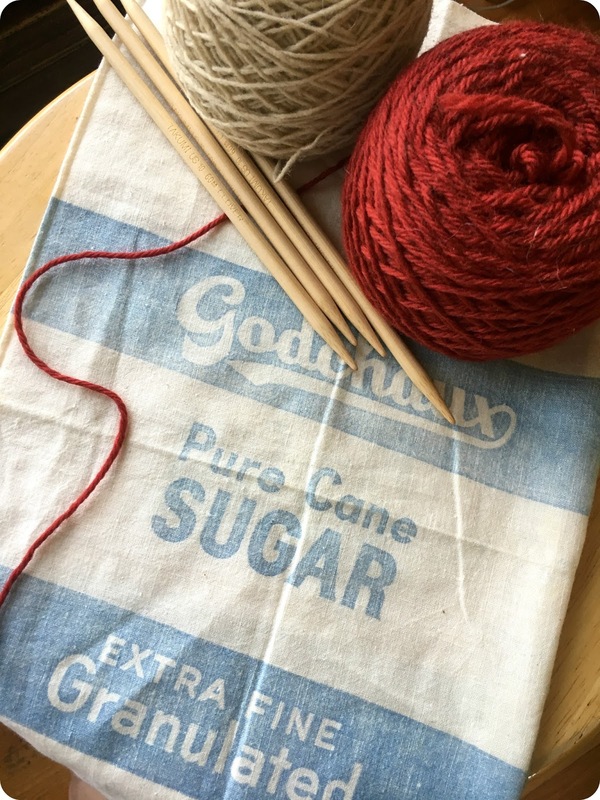 In starting on this project I wanted to be conscious of sourcing the yarn I choose as well as go for bulky weight for speed. Wool is was, and I actually ended up going with Brown Sheep Wool Co. as they are a USA family run and operated yarn mill and company. I found a solid pink and two variegated pinks that I decided hit the mark. 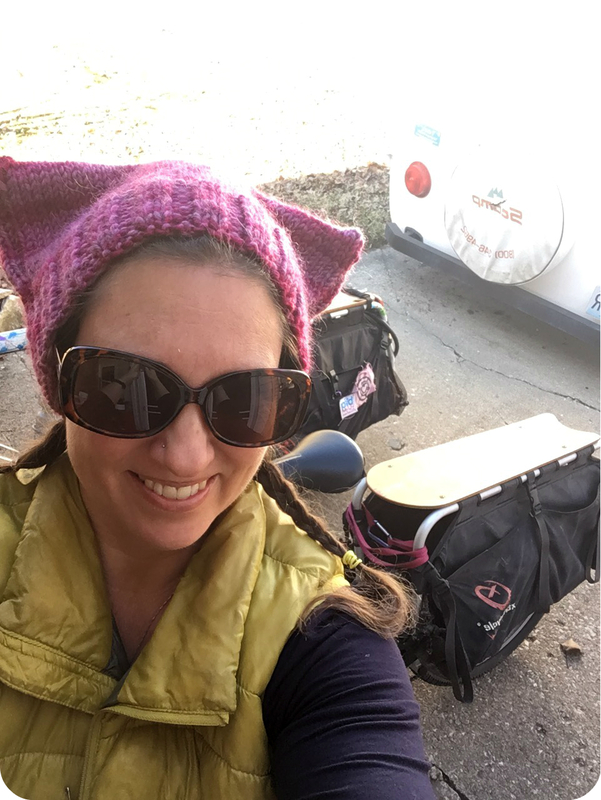 Three of the hats are with their marchers today as they are traveling to Washington. A couple with friends and one a stranger- I wish them all safe and empowered trips this weekend! The last hat that is being finished today is for me as I will be attending my own community sister march. I will wear it proudly tomorrow. 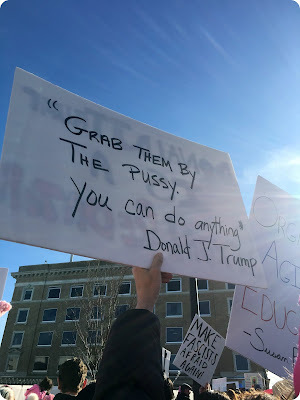 I march with my community to support all of our rights and to show my sons that their is future worth fighting for and about respecting diversity and civil liberties. As I have often shared in my years of blogging I am a firm believer in watching what the universe puts in your path. 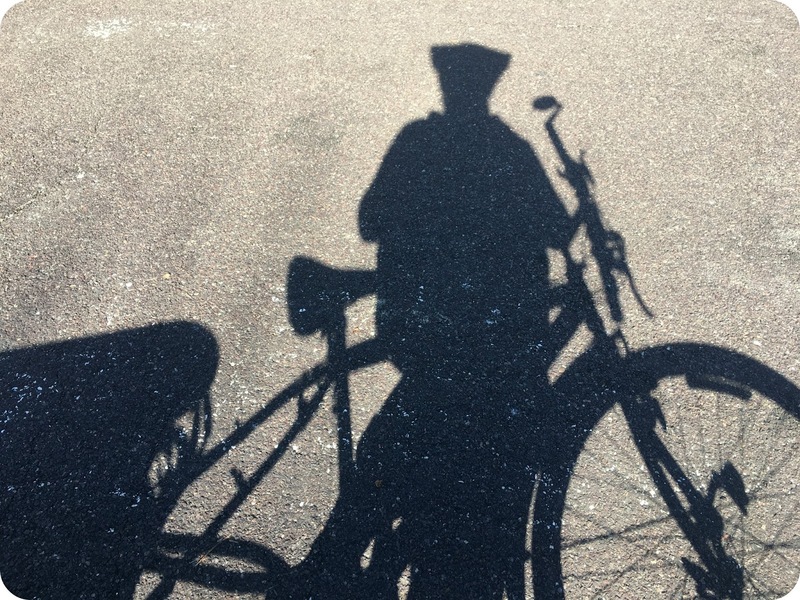 Some call it the "law of attraction"- for me it is just reading the signs. I am sure there are signs that just pass me by that I never catch, but an interesting series of signs caught my attention this weekend. 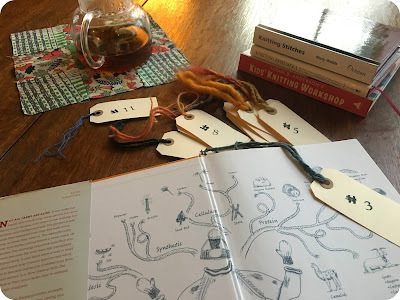 Sunday night I was preparing for a volunteer youth knitting project meeting that I lead and was thumbing through my book Knitting Ephemera by Carol Sulcoski for some bit of trivia to share with the kids. 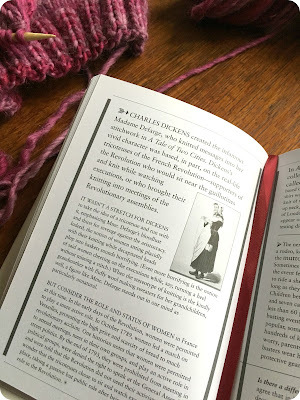 I remembered passing by a passage discussing Charles Dickens' creation of his infamous Madame Defarge in A Tale of Two Cities based on the historical tricoteuse (french for knitting woman). I did not think too much about it till later in the day when my eldest told me he was still working on reading a book for his civics class- and you want to wager a guess as to which book? Yep, A Tale of Two Cities. So I went back and read again the passage in my book and then started to read some academic essays on the work and the role of the tricoteuse in history. 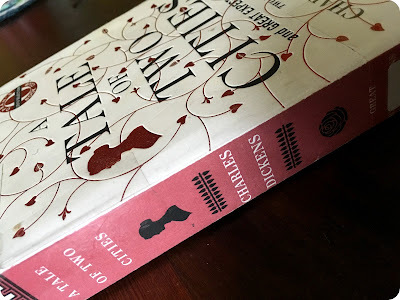 In some shape or form I managed to escape reading this work by Dickens- no small feat considering my degree in English literature! So I checked out the book from my beloved local library today and am going to start reading it tonight as I finish my hat. I am not sure what the lessons are but I am sure there is some connection between knitting for a march against a billionaire entertainer that just took the highest office in our country and this fictional character who steps outside the stereotype of the kindly grandmother knitting who instead knits without dropping a stitch while sitting at the executions during the french revolution after being denied an active role in the political assemblies at that time. Madame Defarge seems more bent on vengeance than what is in my heart but I am curious on analyzing this more after I read the book. 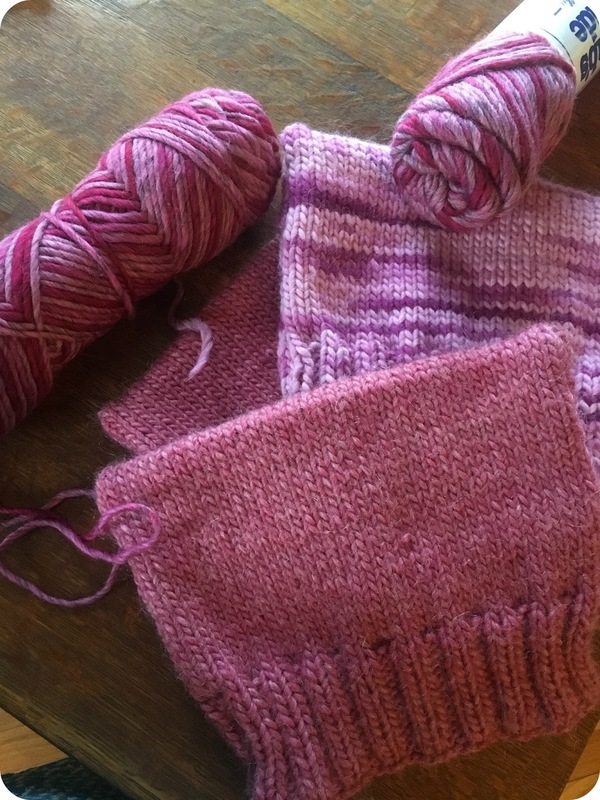 I am most interested in the notion of empowering and owning something like knitting. Busting open those notions of that stereotype of knitting/knitters and how it can be incorporated into activism- exactly what the Pussyhat Project did in my opinion. 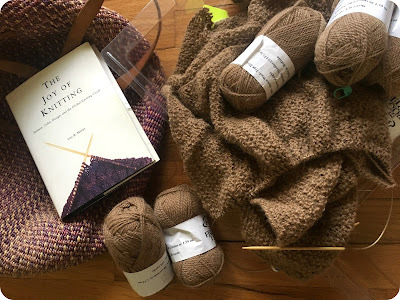 So knit on my friends- sharing also a link to a Knitting as a Political Act download available on Ravelry that I came across last night and here is a link to the sister marches for tomorrow. Reflecting today on how to have my craft be part of the world- to be of service. Today I had my 4-H knitting kids over to my house as we are launching into the 4-H year. This is my second year of volunteer service. To be able to share this handcraft with them is incredibly meaningful- not just in sharing a handcraft down to youth, but in sharing the idea of coming together in a circle of space. For them to break outside of the world of tablets and devices for a few hours and share in conversation and making over cups of tea is huge for me. One thing that I would like to bring into our project this year is how to collectively bring in community service or crafting for a cause. I will be brainstorming with the kids to see what they would like to do. In the meantime we played the identification game once more with yarn, talked patterns, and looked through my copy of People Knitting to see pictures of kids their age knitting just like them- crossing the barrier of time to see their history and future at the same time. I will share more in depth soon of an additional knitting service project I have been working on since December. 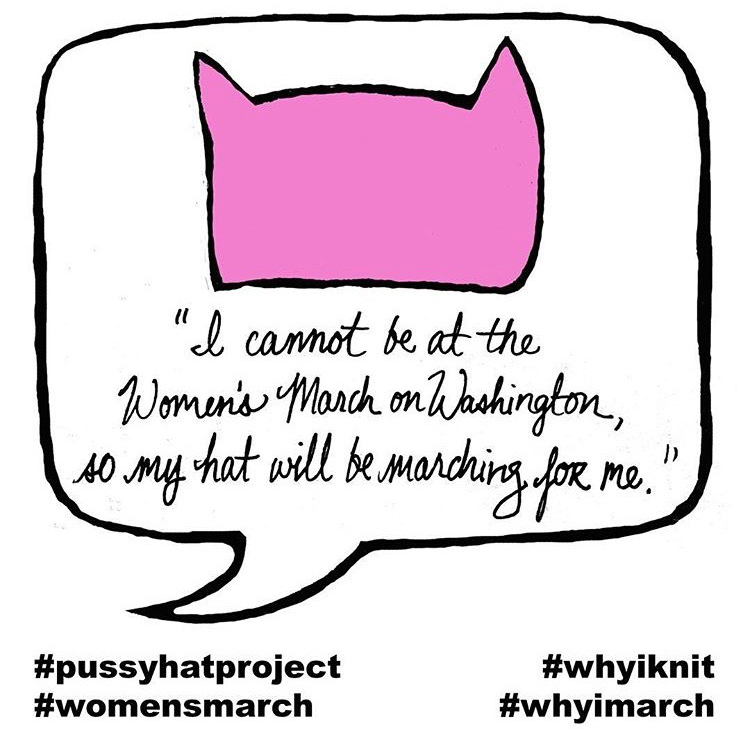 It involves the upcoming marches for Saturday Jan 21 and lots of pink yarn. Check back for the full post! One gift that we have done for my husband's mama since the boys were babes has been a calendar towel each year. It is a tradition we have enjoyed as we had some of the calendar towels from her mother. 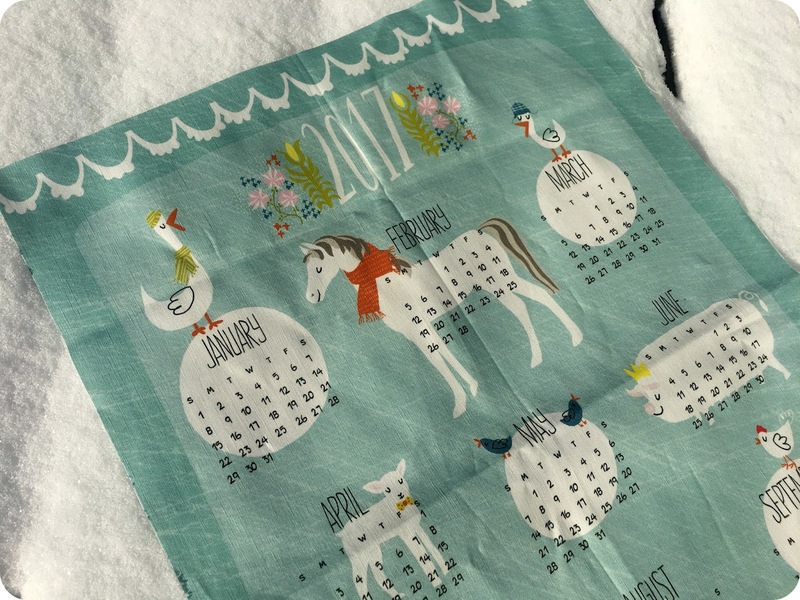 I love the practical side of a calendar that you get to use as a towel after. I started getting one for my work office the past couple of years also. I tend to get them from artists that I enjoy such as oneCanoetwo in 2015 and in 2016 I had a one from Phoebe Wahl. This year I decided to break out and get each family in our immediate families a calendar towel. I ordered them via Spoonflower and cut and hemmed the edges. I really liked trying to match them to each personality- so many great artist work to choose from. If you watch for the sale you can get them sometimes during a fat quarter sale. Watch for these sales and you can get a pretty good deal and with just a little bit of sewing have a fun and practical gift! Mine for this year is whimsical farm animals- love it! I do still watch out for the vintage calendar towels at antique malls as well for special years. I am pretty sure I will do this again for the 2017 holiday season! Speaking of calendars- there will be a shop update coming soon for all three of my wood waldorf calendar. We are welcoming in the New Year and I am pretty sure we are going to need lots of luck during 2017 and then next four years for that matter- ugh! So I knit up a little wool good luck mushroom pulling from our German heritage symbolism that would include pigs and mushrooms in their holiday traditions. 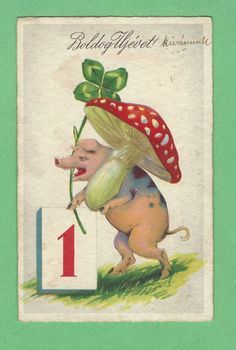 You can see several examples of this in old postcards. 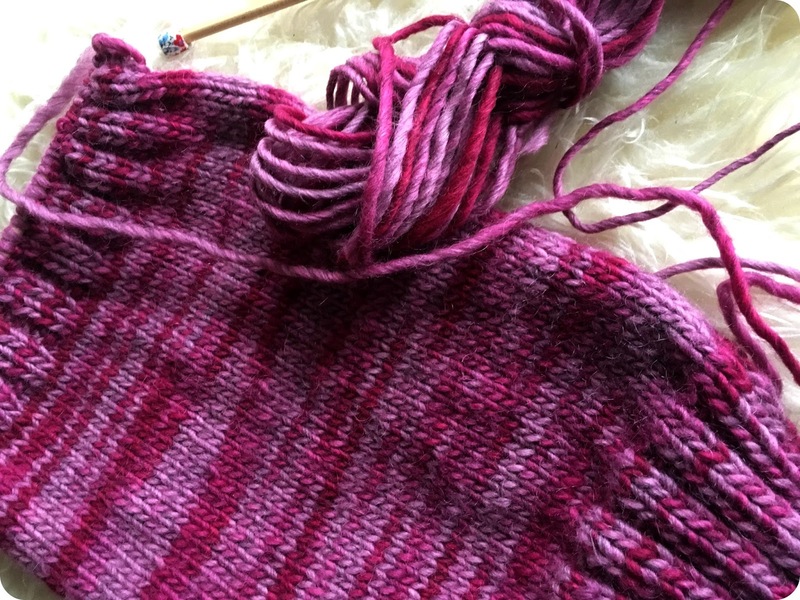 I found this great pattern on Ravelry and it knit up super fast. 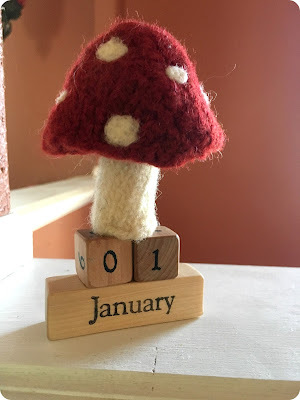 I knit the cap on New Year's Eve and then finished the stem today. I used some wool yarns from my stash- a little Cascade 220 worsted weight dark red and some of my Moeke Yarns natural Elena. I am a bit smitten and just might make more of these for New Year gifts next year. I was lucky enough to get lots of time with my crew the past week and half including a long day of antiquing with my DH. I found this great vintage sugar bag for a knitting project bag. Perfect for carrying a little project with me. I seem to have lots of little projects on the needles so I was happy to have another unique bag. 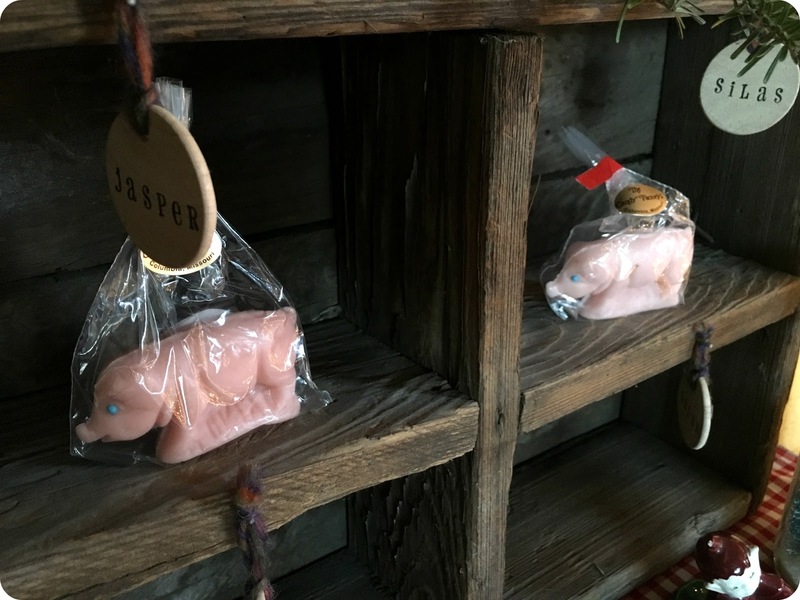 Of course it would not be New Years without the boys marzipan pigs- thank goodness our local candy store carries these and I snatched them up in early December. From me to you- wishing a New Year full of peace and change.